Before mapping your subjects and authorising an app, you must first download, install and configure the Assembly Connector. If you use the default Mathematics or English Courses on SIMS, then you do not need to map your subjects - they will be automatically mapped and you can proceed to authorising the app you want to use. Mapping SIMS courses to Assembly subjects allows you to pull classes from a specific course in to the Platform. If you have a nonstandard Course Short Names for Mathematics or English on SIMS, or want to map courses and classes from other subjects, you'll need to log in to the platform in order to map your MIS subjects to the Assembly subjects. At this point you may need to consult your data manager or someone with access to your MIS. 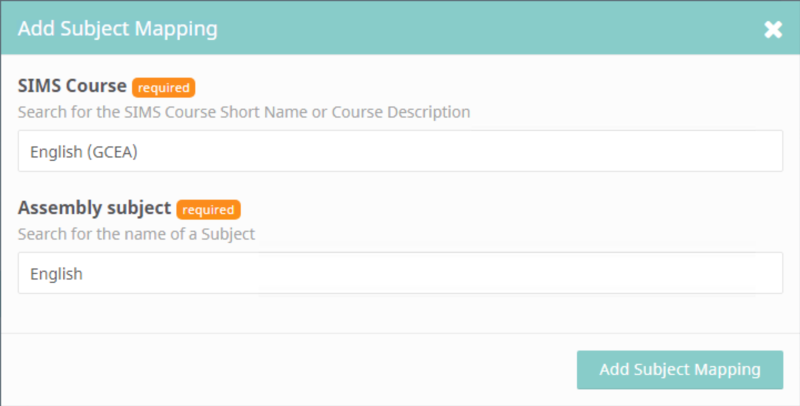 Type in the SIMS Course Short Name and select the desired course and type in the Assembly Subject (eg. Maths) and then click on Add Subject Mapping. You will need to map these to the relevant courses on SIMS. If you aren't sure of the course short name, the below section explains how you can find this out. In SIMS go to Tools -> Academic Management -> Course Manager -> Maintain Course. Search for the subject or course description that you want to map Assembly subjects to. Map the Assembly subject to the relevant course from the dropdown. If you are not able to find the appropriate course in the dropdown, please contact help@assembly.education. Multiple subjects from the MIS can be mapped to one Assembly subject, so repeat this process as many times as you need to cover all courses and classes at your school.